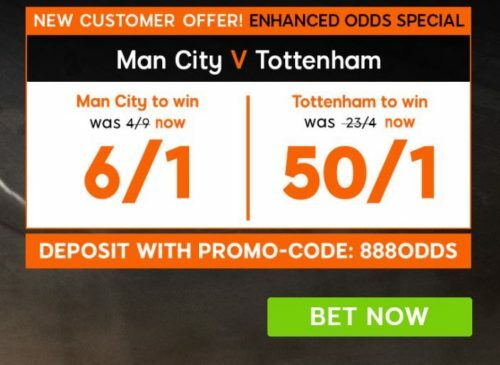 It’s Tottenham Hotspurs’ turn to try to derail the Manchester City juggernaut, with Pep Guardiola’s side already running away with the Premier League. 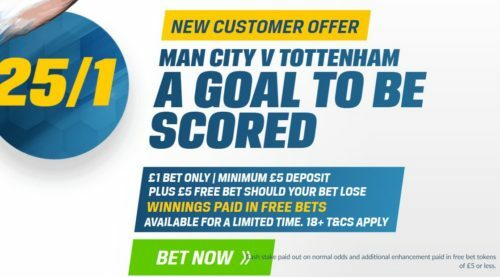 Here are our Man City v Tottenham betting tips and predictions. Last season, Spurs took four points off City, winning 2-0 at White Hart Lane and coming back from 2-0 down to steal a point at the Etihad. The Londoners are currently on a four-match unbeaten run against Saturday’s opponents. 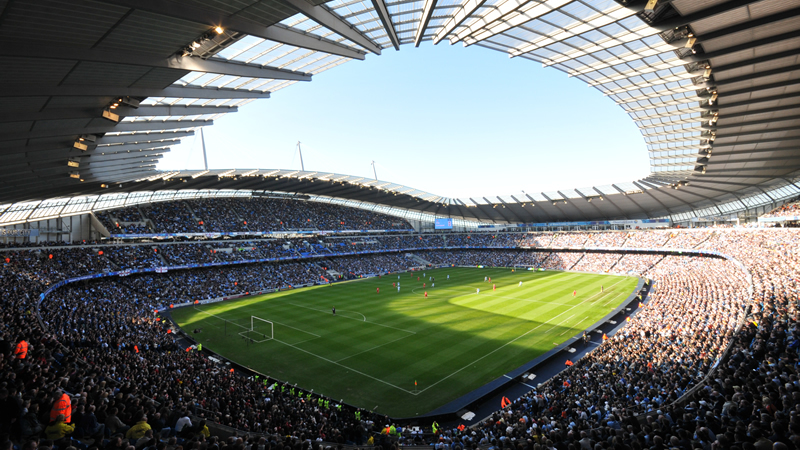 City have set an English top-flight record of 15 successive league wins within a single season. Kevin de Bruyne has now been involved in 13 goals (five goals, eight assists) in his 14 Premier League appearances since the start of September. Christian Eriksen provided his 42nd Premier League assist against Brighton midweek – second only to Mesut Ozil (47) since his debut in the competition (in September 2013). Pep Guardiola has no new injuries to worry about but will again be without captain Vincent Kompany and John Stones. Davinson Sanchez serves the last of his three-match ban. Dele Alli and Mousa Dembele will likely return to the starting XI after being rested midweek. On paper, there’s very little to choose between the Manchester City and Tottenham Hotspurs starting XI. The likes of Dele Alli, Harry Kane, Kevin de Bruyne and Sergio Aguero would all likely feature in a Premier League all star team. The difference between the two sides is those star players’ form. Whilst City’s main men have been blistering this season, De Bruyne, David Silva and Leroy Sane in particular, Spurs stars Alli and Christian Eriksen have struggled for form. Pep also boasts much stronger depth to his squad, with expensive summer signing Bernardo Silva a bit part player, and Aguero and Jesus constantly rotating. Pochettino just doesn’t have that luxury. The Manchester club are on a record breaking run, with 15 league wins on the bounce, but this will certainly be a tough test against a Spurs side with three wins of their own on the bounce in all competitions. The Lilywhites were also the side that ended Chelsea’s 13-match winning streak last season and beat City 2-0 after they’d won their first six matches. Nevertheless, without Toby Alderweireld and Sanchez at the back, you’d expect the City attack to cause a likely Spurs back four too many problems. For that reason, back the home side to win at 2/1 with Paddy Power. Goals can be expected in this one, given the quality of attacking calibre in display. 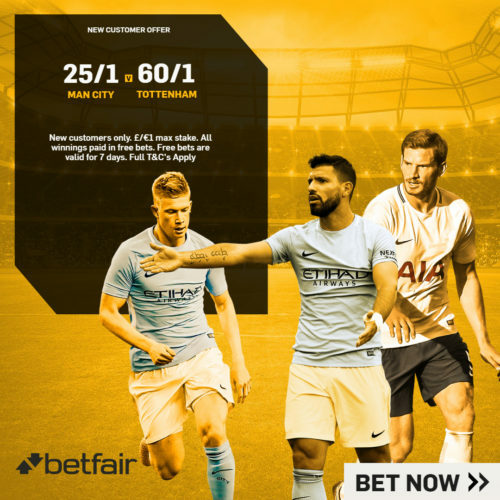 Back a City win and over 2.5 goals at 21/10 with William Hill.